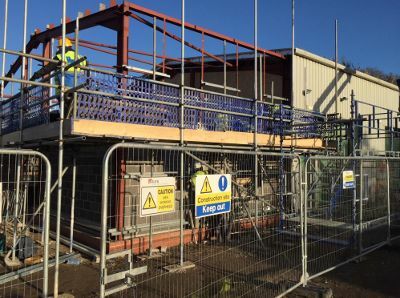 A great deal has been going on at the Avalon Marshes Centre this year with the refurbishment of the Craft Centre, expansion of the workshops and start of physical construction of the new offices. Early 2018 is going to bring more improvements but sadly also the loss of Eco Friendly Bites as caterers on site. Eco Friendly Bites have operated the café at the centre for almost 8 years have decided to cease trading at the centre. Their final opening day will be 17th December. Natural England would like to thank Amy and all at Eco Friendly Bites for providing a great and valuable facility in recent years. However, Amy is not leaving the Eco business and her on-line Eco Friendly Shop business is continuing – why not take a look at the Eco Friendly website. We would like to wish Amy all the best in the future. The Craft Centre building, which dates from the centre’s days as a garden centre, desperately needed significant refurbishment. Funding from Defra has enabled this to happen with 2017 bringing upgraded services, double glazed windows, and attractive insulated timber cladding to the outside. The final step in early 2018 is to “over clad” the roof so it is water tight and fully insulated. The downside of this final step is that the Craft Centre must to be closed from 2 January for four weeks to enable this essential work to be carried out. The work is being carried out by Kier Services. Un-seen by visitors the centre has a muddle of ancient underground services. Once again Defra funding is allowing Kier’s on behalf of Natural England, to completely overall and upgrade the services at the centre. The end result will be a water supply which does not freeze during cold weather, Wi-Fi coverage across the centre, a modern drainage system ready for expanded toilets, fibre broadband rather than snail pace copper wire and many other hidden improvements. To minimise disruption much of this work will be carried out in January when Somerset Crafts and the café are closed. The ‘good old’ offices demolished! Natural England, RSPB, Somerset Wildlife Trust and Hawk and Owl trust staff and volunteers operate from a life expired building and portacabin at the Centre – the first thing visitors see as they come through the gates! Freezing cold in the winter, roasting hot in the summer, flaking paint; their life is at an end. Once again thanks to Defra funding, Natural England are constructing a replacement. The Kier’s team are working hard to have this completed by early March allowing the old offices to be demolished thus opening up to public view the fantastic replica buildings being built by South West Heritage Trust’s “Hands on Heritage” team.